Jayman brings up a fascinating subject in a comment on my post about the frequency of divine intervention. 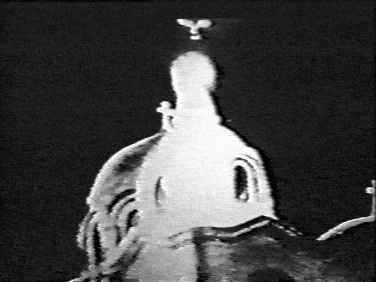 Starting in 1968, and continuing over a 2-3 year period, an apparition of the Virgin Mary appeared over the Coptic Church of Saint Mary in Zeitoun, Egypt. It was witnessed by millions of people of different religious beliefs, it was photographed and videotaped. Miraculous cures were also experienced. Investigations into the matter found no natural explanation. Time to start moving the goal posts? We’re not really asking for anything more. When we ask for evidence, what we mean is we want genuine evidence of God genuinely showing up in real life. It has to be good evidence, valid evidence, evidence that can withstand cross-examination. That’s not asking for too much, surely? Once we have verified that we are indeed dealing with genuine facts and not misperceptions or intentional hoaxes, then we can move on to the question of what the evidence means. We haven’t moved any goal posts until we at least arrive at where the first set of posts stood. And that means having genuine evidence of a genuine appearance. So, what evidence do we have from Zeitoun? Wikipedia (of all places) has a summary that seems pretty friendly towards the idea that it was a genuine apparition. The apparitions were also witnessed by President Gamal Abdel Nasser, and captured by newspaper photographers and Egyptian television. Investigations performed by the police could find no explanation for the phenomenon. 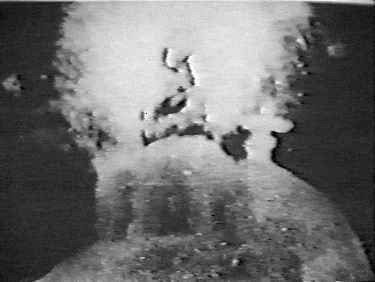 No device was found within a radius of fifteen miles (24 km) capable of projecting the image, while the number of photographs from independent sources suggests that no photographic manipulation was involved. A New York Times article dated from May 1968 by Thomas Brady notes that some Arabs believed that the apparition of St. Mary was a sign that God had witnessed the Israeli occupation of the Holy Land. Oddly, though the Wikipedia entry claims that these apparitions were seen by skeptical observers (including President Nasser), I have not been able to find any first hand reports from these sources. The web sites referring to Zeitoun all seem to be from supporters/advocates, encouraging uncritical acceptance of the claim that this was a real appearance of Mary. There’s an indirect indication, however, in the fact that the police are said to have investigated the apparitions by looking for a projector of some sort. Apparently there was something about these phenomena that suggested a projected image rather than a tangible, physical manifestation. Additionally there was some suspicion that the photographs might have been faked or tampered with in some way. Looking at the first indicator, there are a few things which would be consistent with a hoax based on projecting an image of Mary. First of all, the apparitions would be most visible after dark. Depending on whether the projected image was a movie or a simple slide, there might or might not be movement, though a projected slide would of course be fixed (i.e. you could move the whole image around, but individual elements within the image would remain in the same position relative to one another). And you’d need something to project the image onto: a screen, or a sheet of acetate, or a fine nylon or silk mesh, or a mist, or some kind of smoke: anything that could reflect and/or scatter light enough to hold an image. I would doubt that a screen or acetate would work, both due to the size and due to the difficulty in concealing the edges, reflections, etc. Something solid like that would show up outside the boundaries of the image being projected, and would give away the game. That leaves the lightweight materials: a fine gauze, a curtain of mist, or a cloud of fine smoke (which would also benefit from the added concealment of night. If such materials were used, they would tend to billow, thus making the image appear to move, and also blurring any long-exposure nighttime photographs. There would also be nights when the weather was unsuitable (e.g. too windy) and borderline conditions where the cloud would be too hard to control, resulting in fading and/or indistinct shapes and blurs. And even on good nights, there might be variations in size, depending on how far the reflective medium was from the projector. Of course, nothing says you have to use the same materials and methods all the time. Varying your tools and techniques would help promote the hoax (if hoax it was), and would give you an argument to discredit skeptics (“You think it was X, but here’s a case where the phenomenon was Y.”) So that’s a few of the things we could be looking for if we want to know whether Zeitoun is more consistent with what we would expect from a miracle, or with what we would expect from a hoax. On to the apparition itself. One fairly obvious question one could ask, of course, is how do we know this was Mary? We have no photographs from the first century, and the paintings of Mary tend to portray whatever the artist imagined her to look like. So how do we know this was really Mary and not, say, the ghost of a murdered Egyptian girl come back to haunt the site of her demise? The answer lies in iconography. Icons were the ancient solution to the problem of how to write down important ideas for people who couldn’t read. A casual visitor to a modern Orthodox church, for instance, might find the icons fairly primitive in artistic style, but that’s a misunderstanding of the purpose and significance of icons. They aren’t meant to be photographic representations of how things actually appear, but rather, are collections of symbols that convey key points without requiring any phonetic literacy on the part of the worshipper. The halo, for example, represents divinity (an idea borrowed from contemporary pagan art), and thus by association someone who either is divine or has some sort of special relationship with the divine. It wasn’t that the person actually had a glowing bubble around their head like some kind of space helmet (Erich von Däniken, are you listening? ), it’s that the sun disk symbol became the symbol for all divine beings, and eventually of the servants of God as well. 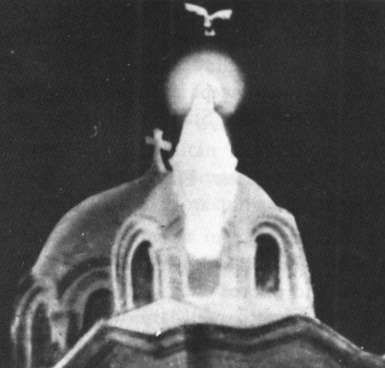 According to the caption, this is a “Photo of the apparition of the Virgin with the Infant Jesus Christ in Her arms over St. Mary Coptic Orthodox Church, in Zeitoun, Egypt.” But wait just a minute. I was talking about icons, not about the real life Mary, or how she would appear if she showed up in real life. Yet here she (allegedly) is, manifesting above the church in Zeitoun, holding the baby Jesus in her arms. Correct me if I’m wrong, but isn’t Jesus supposed to have grown up before he died? Yet here he is, back in infancy again, just like in the icons. Well, I suppose if Jesus is God, he can take whatever form he likes, right? But the fascinating thing about this particular “manifestation” is that it’s part of a web site about Mary appearing in Egypt. Even the caption puts Mary first; Jesus happens to be just tagging along, helplessly, like any infant controlled and carried around by its mommy. We don’t call it “an apparition of Jesus with his mother,” it’s an apparition of Mary. Oh, and Jesus too. But isn’t Jesus supposed to take priority over mere mortals like Mary? She is not God (or at least, not yet—there is a movement among certain Catholics to have her declared co-redemptrix along with Jesus, and maybe even a fourth member of the Trinity). But there are more interesting features about these apparitions. Check it out: Mary has her space helmet on. The halo that was a symbolic, non-representational embellishment in iconography has been taken literally, and added to the image of what Mary would supposedly appear like in real life. Oops. But don’t worry, the church has come up with an explanation that covers that little gaffe: “heavenly apparitions may take forms known to us, so that we can understand them.” Either that, or somebody slipped up while attempting to create an image that would be unmistakable as the person in the icons. As in traditional icons, the disk is behind the head, even when the head is in profile. But in order to appear as a disk from all angles, it would have to be a sphere, like a space helmet. Icons, however, consistently portray the halo as a disk behind the head. So much for “forms known to us!” Somebody just slipped up. The images being projected are not just like the icons, they are the icons. Another feature of these manifestations are the glowing, giant doves that appear, and move quickly, in rigid formation, without flapping their wings, and then disappear again. In classic Christian theology, doves don’t go to heaven when they die, so the church identifies these birds as “angelic beings in the form of doves.” But have a look at these “doves”! 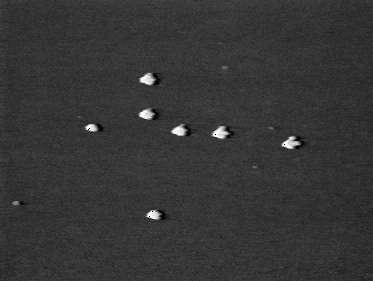 Not only do they appear in shapes that owe more to the non-representational symbols found in icons, but they’re all cookie-cutter copies of the other doves in the same image! According to the official account, these birds “differ from the normal pigeons in that they are able to fly at night; they are also bigger in size and different in shape. They appear from nowhere, do not flap their wings as they fly and disappear as they came.” Kind of like what you would see if you put a picture of stylized doves on a slide, and swung the projector around to move the image, right? But look at those images again. Notice anything unusual? They’re nighttime photos (though the one on the bottom looks like a videotape capture), and the longer exposure times might account for the blurring of the dove shapes. Yet there’s none of the streaking or motion-blurring that we ought to see if several bright objects were moving “at high speed” against a darkened nightscape. Hmmm. Look closely: the second photo is a bit more over-exposed, but the dove appears exactly the same, both in its wing positions and in its location relative to Mary’s head. This is exactly what we would expect to find in a projected 2-dimensional image, like an icon: you don’t have the perspective effects of one 3-dimensional body passing in front of another, so the objects in the image maintain their relative positions no matter what angle you view them from. 5. The Incense: It used to permeate the place with its strong pleasing smell and white colour. Jayman raises an objection in the church’s defense. The light trick would have to create multiple moving figures (Mary, birds, mist, stars) that could change shapes and that would appear and disappear. The lights would still have to work even after the power was cut to the area in an attempt to catch a hoax. The illusion would have to work at different angles. Does such technology exist today? Did it exist then? Any decent light show can do as much, and we’ve had non-electrical light sources for a lot longer than we’ve had electricity (ever hear of limelight, or flares?). Some kind of burning material could serve as a source for both the smoke and the light, and if any kind of chemicals were involved, incense would hide the tell-tale odors (at least from those who didn’t want to find them). Let’s not forget what a tremendous financial windfall this “apparition” has been for both the struggling 3rd-world church and the immediate neighborhood in which it is found. “Zeitoun was more of a Cairo suburb than a district in it; now it has become one of the thickly populated districts in Cairo. Tumanbay Street, where the Coptic church lies, is a main street at Zeitoun. Opposite to the church there used to be a big garage for the buses of the Public Transport Authority,” says the late Rev. Father Boutros Gayed. And the resulting pilgrimages have made the church so popular that it was both necessary and possible to undertake a substantial renovation of the property, resulting in a new cathedral that cost more than two million pounds (pdf. report available here). I’ve left out some other really fascinating stuff, like the mysterious absence of any audible component to this “apparition,” or the fact that the image tended to be weaker on some nights than others, or the fact (and related photos) of Mary sometimes appearing only from the waist up (insert bad joke about this miracle being “a bust”). And I’m way over my usual budget for blog posts, so I won’t go into the other elements of this complex tale, like the alleged healings. I have to say, though, that Zeitoun has all the hallmarks of a hoax perpetrated for the financial gain of a rather superstitious and credulous parish. I can’t absolutely prove it; after all, it’s possible that God would, for some reason, want to create an unmistakably supernatural and divine manifestation, and then take the trouble to ensure it would possess a complete list of all the ingredients necessary for a naive and rather obvious hoax. What the purpose would be, other than to discourage critical thinking and the habit of discerning between the real truth and the deceits of men, I can’t imagine. But God works in mysterious ways, eh? Or at least someone does. And maybe we’ll catch him/her/them some day. Oddly, though the Wikipedia entry claims that these apparitions were seen by skeptical observers (including President Nasser), I have not been able to find any first hand reports from these sources. I don’t think you will be able to do a full-blown investigation of this apparition by merely using the internet. Plus, many primary sources are in Arabic. There’s an indirect indication, however, in the fact that the police are said to have investigated the apparitions by looking for a projector of some sort. Apparently there was something about these phenomena that suggested a projected image rather than a tangible, physical manifestation. Additionally there was some suspicion that the photographs might have been faked or tampered with in some way. I think the Wikipedia article is noting that the obvious natural explanations have been investigated. Looking at the first indicator, there are a few things which would be consistent with a hoax based on projecting an image of Mary. First of all, the apparitions would be most visible after dark. How would a projection work when lights were on around the church? Wouldn’t the source of the projection be obvious (especially when they cut power to the whole area)? And you’d need something to project the image onto: a screen, or a sheet of acetate, or a fine nylon or silk mesh, or a mist, or some kind of smoke: anything that could reflect and/or scatter light enough to hold an image. Wouldn’t a projector result in a 2D image? You need to posit a system where the apparition can be viewed from different angles without the hoax being found out. Check it out: Mary has her space helmet on. You can’t tell on the first or third image, but the head is most certainly in front of the halo on the second image. I even ran the second image through some image analysis software just to be sure. So much for “forms known to us!” Somebody just slipped up. The images being projected are not just like the icons, they are the icons. Since the witnesses had no problem identifying Mary she most certainly did appear in a well-known form. Also, it sounds like you are complaining that the apparition is both too much like icons and too little like icons. Of course it couldn’t be an actual icon since there aren’t video icons. Ultimately, Mary’s form is not important in determining whether or not a hoax took place. Fascinating, isn’t it? A projected (hoaxed) image would need something like smoke or clouds to project onto, and that’s just what we have at Zeitoun! If an image were projected into smoke wouldn’t it obviously be a fake if one were to move to a different angle? What did they use when no smoke was present? Any decent light show can do as much, and we’ve had non-electrical light sources for a lot longer than we’ve had electricity (ever hear of limelight, or flares?). Care to provide an example of a light show that is convincing from multiple angles? It would also be helpful if it worked from more than 15 miles away. I tried searching for some light shows but all the images and videos were not what we need for this kind of hoax. I have to say, though, that Zeitoun has all the hallmarks of a hoax perpetrated for the financial gain of a rather superstitious and credulous parish. On what basis can you call the parish superstitious and credulous? They apparently allowed numerous investigations into the matter and are in a much better position than you to know what happened. Also, I would think their Muslim neighbors (the majority of Egyptians) would have liked nothing more than to show this to be a hoax. It’s very un-Islamic for Mary to be bowing before a cross. All they had to do was put something between the projector and the smoke and the hoax would be found. Yet they could find nothing in a 15 mile radius. The image is 2 dimensional, not 3 dimensional. In the photos on line, it is proportional from one angle only, all other angles show a distorted image. No real investigation was done during the images appearance. Since no photos exist from the top of the church, so evidently all persons were banned from the immediate area. This is similar to a magician exercising tight control of the audience location in order to sustain an illusion. The credulous nature of the audience is revealed in the on-line ancedotes — a sick man, unable to walk is miraculously healed, and two doctors announce via loudspeakers to the crowd he now has the heart of a young man. Without any medical tests? Please! When Western newspapers take interest (educated skeptics are on the way!) the image disappears never to be seen again. You can always count on the local superstitious folk to fall in line, gullibility is a personality trait whether it is weeping statues or UFO’s. The motives for the hoax? Money as usual. The Middle East has supplied religious relics on demand for centuries. And don’t forget that Egypt during the late 60’s had found a ready market in Westerners begging to be fooled — Erich Von Daniken (Chariots of the Gods) purchased numerous “alien artifacts” in Egypt to provide “evidence” for his very profitable series of books. I have found that believers, whether the subject is religion, conspiracies, UFO’s or Bigfoot, are always create an amplification and filtering mechanism to use in evaluating “evidence” for their particular fantasy. All supporting details are magnified, all details to the contrary possess some “flaw”. The skeptic on the other hand, does just the opposite, demanding rigorous proof (via the scientific method) of the positive, and careful consideration of the negative, demanding all questions be answered where possible. Can you provide links to the two photographs that show this? Based on Google Maps, photos of the church, and photos of the apparition it appears that people could stand at different angles which would reveal a 2D image. If a projector was used it would have to be able to project a convincing 3D image. I’ve read of multiple investigations by different branches of Christianity as well as investigations by the Egyptian government. The government investigations involved cutting power to the whole area and searching a 15 mile radius for a projector. Whether anyone tried to see her from the church’s roof, I don’t know. There do seem to be photos from roof level though (from other buildings). When Western newspapers take interest (educated skeptics are on the way!) the image disappears never to be seen again. This page has a couple NY Times articles from 1968 and the apparitions continued until 1971. At the bottom of that page there’s a pretty good story about a muscular young priest, a burly Muslim epileptic, and a devil named Sergious. Can you provide links to the two photographs that show this? I thought you were the one with photographic evidence of a miracle? I have seen no photos without distortion or blurring of detail other than the one forward view posted here. All real images do not suffer quality because of a change in angle (other than external lighting). If you can find a good side or back image of the apparition, please provide a link. …the government investigations involved cutting power to the whole area and searching a 15 mile radius for a projector. Whether anyone tried to see her from the church’s roof, I don’t know. There do seem to be photos from roof level though (from other buildings). As usual with hoaxes, there is no evidence that anyone has done the obvious, like go as close as possible to the image and photograph it. Independent investigations are required anyway, we have already seen that “doctors” were proclaiming miracles on the spot. Have you never watched television infomercials? — no shortage of “studies” and testimonials for whatever is being sold. …a couple NY Times articles from 1968 and the apparitions continued until 1971. No evidence of continuous manifestations, no later photos, just evidence of trotting out the apparition on anniversaries to keep the tourists happy. What brands this as hoax is the lack of documented competent investigation into the matter. Instead we have a lot hype generated by the very people controlling the access to the apparition. I thought you were the one with photographic evidence of a miracle? This miracle story (and another miracle story) were not brought up to prove a miracle happened. They were brought up to show certain logical inconsistencies in skeptics’ thoughts. As I noted already, any full investigation of this apparition, whether for or against its miraculous nature, would involve more than searching the internet. If you can find a good side or back image of the apparition, please provide a link. The number of unique photos online is limited. Since the apparition is said to have changed forms we would need to find two photos taken at the same time but from different angles in order to prove that the apparition was “flat”. I have not found two simultaneous photos online. However, other clues lead me to believe that a simple projection of a 2D image would have been easily detected. (1) Witnesses could stand at different angles, meaning a hoax with a 2D image would be difficult to pull off. Note, for example, how the two images containing the church on this page are from different angles and different elevations. Pearl Zaki states that the church was at the corner of the intersection of two streets, meaning at least two of the four sides of the church could be visible from the streets. Wadie Shumbo mentions Mary moving from one side of the church to a side of the church which was out of his view and then returning to his side. (2) Christians are greatly outnumbered by Muslims in Egypt. There were plenty of hostile witnesses who would want to demonstrate that Mary did not actually appear at a Christian church and prostrate before the cross (idolatry in Islam). People tore out electrical wires because they thought it was a trick. One Muslim threw stones at the pilgrims and called the police for them to be arrested. (3) Lights appeared above the church which would be very difficult to fake with a simple projector and screen (e.g., bird-like creatures flying around the church). (4) The church was floodlit, which would not be conducive for projecting an image. As usual with hoaxes, there is no evidence that anyone has done the obvious, like go as close as possible to the image and photograph it. I don’t think we can draw that conclusion from what’s online. Pearl Zaki saw Mary standing on the ground beside the church and Mary is said to have been in the church courtyard at times. People climbed trees to try and touch the apparition. Independent investigations are required anyway, we have already seen that “doctors” were proclaiming miracles on the spot. One would need to look over the investigations that were done. A commission of seven physicians and professors investigated at least some cures. You said the apparitions stopped once Westerners showed up. The NY Times went to Egypt in 1968 (the last article on that page was from August 7). If you were correct the apparitions should not have continued. But Mary appeared about 2-3 times a week for nearly two years! By 1970 the apparitions happened about once a month. The last appearance was recorded by the National Enquirer in 1971. Clearly a hoaxster did not stop out of fear of “educated skeptics”. Were they in a boat, or did they walk into a bar? You realize all you’re giving against the Marian Apparition in Zeitoun is hearsay right? You’re throwing around a lot of crazy accusations but not giving us a single shred of proof that this is in fact a hoax. Nobody has been able to prove that these apparitions are a hoax in 40 years. What makes you think that just stating that it is a hoax is going to prove otherwise. Get people solid proof then talk. I happen to have seen Penn and Teller in Las Vegas recently, and I can’t explain how they did some of their “magic” either. That doesn’t mean that the default explanation is that it’s real magic unless and until someone in the audience can explain how it was done. Likewise at Zeitoun: I probably can’t tell you any more about Zeitoun than I can about Penn and Teller. I just can’t help noticing that the “apparitions” have a lot more in common with the characteristics of projected images of familiar icons than we would normally expect to find in a genuine three-dimensional manifestation of a genuine deity. God might have some reason for wanting to make sure a genuine miracle looked like a hoax, but it seems a bit deceitful. At least with Penn and Teller, they were open and up-front about deliberately fooling us, for entertainment. But the Zeitoun “miracle” seems to have had far more at stake financially than what Penn and Teller make off of their tricks, so it makes sense that whoever was responsible would be reluctant to give away the trick and risk losing a steady multimillion-dollar revenue stream. since it’s not convincing, either it didn’t come from God or it’s not meant to be convincing. In either case, it’s only credible to those who already believe or aren’t critical thinkers, so mooting it as credible evidence is inane. A convincing miracle, that would really be a miracle! I would like to distance myself from debaters who use this technique. Now, I’ve certainly accused many a skeptic of moving the goalposts, but it only occurs after I provide a sample case that fulfills their stated criteria. For example, jim demands that the alleged miracle be “unambiguous” and “stringently verified.” But Zeitoun meets both these criteria – the apparitions were unambiguous in the sense that were clearly visible, and the apparitions were stringently verified in the sense that many people of different faiths reportedly saw them. I would add that there is a converse psychological trick that skeptics employ in these types of discussions – the old “that’s not what I meant” response. Such is why I refuse to discuss my alleged miracle cases with anyone sans a pre-agreed and rigorous set of criteria by which we might judge them. I don’t want the skeptic to simply dismiss my research by saying, “That’s not what I meant by unambiguous and stringently verified.” Okay, then what does the skeptic mean? I ask this and I get accused of all sorts of unsavory things, which is very confusing. So, I agree with you that questioning the evidence does not necessarily entail moving the goalpost, although some instances of questioning the evidence may be rightfully attributed to a desire to move the goalpost. There are obviously many troubling aspects of the Zeitoun apparitions. Yet, the staunch fact of so very many apparitions over the centuries, with so very many witnesses, with so very many elements of evidence, points to a preponderance of likely authenticity. We must be careful not automatically to assume that every incident that occurs in a third-world country is hoaxed, that Egyptian newspapers are somehow inferior to ours or that Egyptian investigators are either lazier or dishonest (e.g., that the police were in cahoots with the putative hoaxers). That all said, the light show looks pretty darned impressive to me. Zeitoun doesn’t have many apparitions over the centuries, but even if it did, it’s really not all that hard to get credulous people to think they’ve perceived something that reinforces what they want to believe. Many mediums and spiritualists make a living off of this kind of thing—in fact certain outright frauds like Sylvia Browne are doing quite well because of it. Crop circles are an even better example, because it’s not just true believers who see the phenomena, anyone can. Saying “Yes, people really did see something” is not the same as showing that what they saw was an authentic case of whatever they thought they were seeing. To the believers in this nonsense, I would like to ask several questions. I will not repeat the various skeptical points that were already raised. I’ll just say that they are obvious and I agree with them. This does have the marks of a typical hoax and gullible people simply buy this story hook line and sinker. 1. Why do all the images look like they were doctored? You don’t need Photoshop to create these kind of images. This can easily be done in the darkroom, either by placing an object on the exposed paper, or via a technique of photo montage. These techniques are very old, and were around for decades before the late 60s. 2. Why is there such a small number of available photos (that, again, all look doctored)? Presumably, such a momentous event would have received widespread coverage, both by legitimate, Western, media and by passerby. We would have expected to see MANY photos of such an amazing phenomenon that occurred for around two years on a regular basis! Surely a few people from the alleged millions that have seen this would have taken photos. Why have they never surfaced? 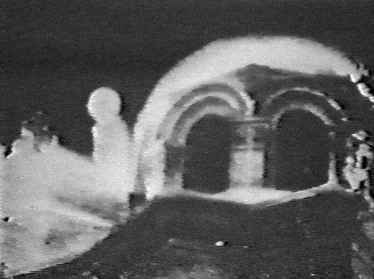 Do you think it’s reasonable that such an amazing apparition, that lasted for so long, several times a week, sometimes even as long as 8 hours, and allegedly was witnessed by so many people, would have only a scant few photos? 3. Why are there no videos of this momentous event? Video was not unheard of in Egypt during those years. There are many videos of countless events in Egypt during that time, but none of this astonishing event, which, again, lasted so long and was seen by so many. None of the millions have thought of videotaping this event? No one from the worldwide media? 4. It has been claimed that the police investigated this matter, and ruled out the possibility of a hoax. Where is the police report? In all the literature on this matter I have not seen this alleged report. Surely the police would have kept a record of such a momentous event, particularly that, according to the story, it interfered with the traffic for two years, the police had to shut down the electricity for a 15 mile radius and so on. Such extensive work by the police surely would have left some written record. But there is none. 5. In some of the reports, Mary appeared through a cloud of incense. And, of course, as pointed out by others, she always appeared at night, never by day. Don’t you at least see the possibility that the perpetrators of this hoax simply released a cloud of smoke or fog and then shined an image on it, to give it a 3D appearance? If you want proof of the Virgin Mary apparition above Saint Mary’s church in Zeitoun, Egypt, all you have to do is watch the videos of the event on: You Tube. The whole story was on NBC on their show “Unsolved Mysteries.” The witnesses of this event are also interviewed…And don’t forget, but the whole dome of the church was illuminated by a strange light, and the doves, as well as the one above the Virgin Mary’s head, were seen to come down from outer space….As to my opinion of this phenomenon, I agree with the great Swiss psychiatrist, Carl Jung, that the apparition was an “archetype” of the unconscious mind being projected over the church. However, since I believe the “unconscious mind is “God” Himself, it only makes the apparition more real and holy….. I am glad that God led me to this blog to participate with my direct experience with these miraculous apparitions. I just want to answer a couple of questions raised in this blog. 1) Why there are few pictures? – In 1968, cameras were not affordable as of today. It is not common in socialist Egypt-where even dolls were not allowed to be imported- that people would own cameras. (I personally did not have a camera). Unlike today when many people have mobile cameras and digital cameras, only very few people owned cameras back then. – Among the very few people who had cameras, even fewer were able to operate the cameras. Something absolutely strange thing happened back then, but some of those already few who had cameras had a strong sense of immobility and could not even move their hands to operate the camera! Let’s put it this way, when you see Virgin Mary appearing before your eyes, you will forget the world. Having said that, I would also like to point out that there were some people on site who had what we called “spiritual Coma”. They were so much absorbed by the heavenly presence of Virgin Mary that they were totally unaware of their surroundings. They would remain looking at Virgin Mary even after she disappears, and when people try to pinch them or shake them in order to get them out of their spiritual coma, they do not succeed- not until a long while. – Those who were able to operate their cameras, were not successful at taking good shots, because the heavenly light was so intense that it burnt the negatives most of the times. This leaves us with very few successful shots of the heavenly phenomenon. I personally believe that God, although allowed these miraculous apparitions to take place in order to strengthen Christians and turn a huge backlash against the rising islamic propagandas, God did not want many pictures to be taken because God still wants people to believe in Him without miracles. And this interpretation is based on a Biblical response I had from God as soon as I asked “why don’t you just send angels to the World so that the whole world would at least recognize Your presence?” The answer came straight away: Luke 16: 27-31: when the rich man asked for a miracle so that the rest of his family on earth would know of God, the response was that if they did not understand God and know God through what is available on earth, then they would not believe even if a resurrection miracle was performed before their eyes. I understood from God’s response to me that God has manifested Himself everywhere and if people are not sensitive and smart enough to recognize His presence and beauty through His works on earth, then even if they saw a miracle before their eyes, they will still not believe. Do you know why? Because they have lost their senseless and mindless, no matter how far they claim to be sensitive and smart. They have shut down their senses and set their minds on not seeing God, so that even if God Himself appeared before them, they will deny their eyes and accuse themselves of hallucination! Anything but acknowledging what their minds have so long been set and programmed on not believing to be true. That’s one of the main reasons my dear for why not all people covert when they see a genuine miracle. Let us not forget the people who have witnessed untold miracles, yet their minds were blind and cruel: (EX 4: 1), (EX 33:5), (Jeremiah 5: 21), etc. So sadly the possibility of people continuing to be stupid even after seeing a tangible miracle before them is there. Another reason that is very much applicable in the islamic world: THE PRICE of acknowledging the truth. Many muslims converted in Egypt after seeing the apparitions, but they had to convert secretly and some were able to flee the country, because according to the quran: Anyone who converts, his blood is “Halal” or lawful to be shed- which is the same problem we have until today. Therefore, any convert in islamic countries is aware of the death threat awaiting him/her upon conversion. As a result, they either migrate (if they have the financial capability to or they hide away from their families and communities or they stay Christians under cover (i.e stay with their families and pretend to be muslims when they are in fact Christians). Many others could not convert, because the price of conversion was so high for them. Many muslim women just ended up hanging the picture of Virgin Mary and The Lord in their houses and fasting every year with Christians the fasting of the assumption of Virgin Mary, which takes place for two weeks in August. They could not convert because they will lose their husbands, their children, and more. The price of conversion is so high: you lose your job, you lose your friends and get harassed by the community (least measure of persecution), you lose your marriage, you lose your children, and you will be absolutely blessed if by some miracle you did not lose your life as well. So there are economic, social, and psychological pressures on anyone who wants to embrace the truth that God has revealed through miracles and apparitions. Persecution now in islamic countries are even far more worse than during Nasser. By this, I answer the second question about the impact of the miracle on people. Let’s take the example of President Gamal Abdel Nasser. This president was the first one to take the leadership of the entire Middle East region. He was socialist and he promoted for pan Arabism or Arab Unity based on common Arab history and islam. In his reign, the Azhar institution flourished and waged its islamic propagandas and the first 24/7 quranic radio channel was launched. So you can imagine the extremely bad timing of these apparitions for the president. Last thing the president or el Azhar institution wants to see is Virgin Mary appearing on a Church in Egypt. It simply blows up everything they have worked for. Last thing that this arab world leader want to do is to acknowledge the apparitions, yet on the day he showed up to see for himself the apparitions, God insisted that Virgin Mary appears on that night for FIVE long hours! So that the president will have no excuse for not seeing her. Now, I would think if this president was living in another world, he would have declared his conversion, but the price was so high for him…he could not lose his political position and glory for the sake of acknowledging the truth and embracing it into his life. The only thing he could do in the face of the powerful presence of truth that he could not deny is to give away the huge public buses garage which lies across the Church to the Church in order to build a big Church. Of course his decision was criticized, but how can he fight God?! He could not stick out his neck in order to embrace the truth, but the least thing he can do is to behave well towards Christians now that God has revealed for him the truth. Ahlan wa sahlan, Zaki, thanks for stopping by. I have to say, your first explanation for the lack of pictures, that Egyptians didn’t have good cameras and/or photography expertise, seems to fall a little short. 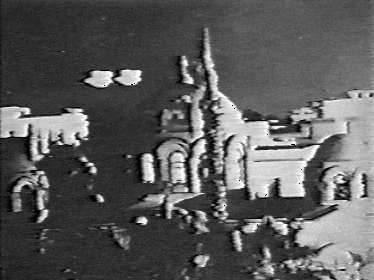 The stories say that “According to eye witnesses, the Virgin Mary appeared in different forms over the Coptic Orthodox Church of Saint Mary at Zeitoun for a period of 2-3 years beginning on April 2, 1968…[and] were seen by millions of Egyptians and foreigners, including Copts, Eastern Orthodox, Roman Catholics, Protestants, Muslims, Jews and people of no particular faith.” That millions of foreigners would travel all the way to Egypt to see a miraculous apparition, and never think to bring a good working camera, seems a bit hard to swallow. Nor do the pictures themselves appear to have been taken in a strong light (except of course for the badly retouched “night” photos that were obviously taken during the day, of course). You have seen dramatic lens flares in pictures in which a bright light source, such as the sun, was within the frame. The brightness of the light sets up internal reflections within the lens itself, and are a good indicator that the lens is aimed at a source that is too strong. But there are no lens flares in the Zeitoun pictures–they merely look like ordinary night shots that held the shutter open a few seconds too long. Nor is it all that hard to put a piece of dark glass over the lens if someone does want to photograph a bright light, or to use the pinhole projection technique like scientists do when they photograph the sun. I notice your story of persecution by Muslims and of Muslim rejection of the “visions” seems to conflict with the official Zeitoun accounts, which claim that the Egyptian police (and even Nassar himself) corroborated the story. Perhaps you could clarify that so we know who to believe? The bigger issue, of course, is whether or not it’s really God’s will for people to see visions of the Virgin Mary. It’s easy to see why an ordinary hoax would eventually stop happening: running out of time, increased risk of detection, or even just satisfaction with the results produced. After all, the visions, whatever they were, ended up producing enough of a financial income for the parish that they could afford a few million dollars to spend on a new building. Why would anyone risk losing that kind of cash flow by exposing their scam to continued scrutiny? It’s less easy to see why God would fail to demonstrate a consistent attitude towards the question of whether it was good or bad to have people see Mary. Everybody who talks about the apparitions from a believer’s perspective seems to take the position both that they were a wonderful blessing and that we’re better off without them. But why would anyone be better off without God’s tremendous spiritual and physical blessings? It just doesn’t make sense. And of course, there’s always the ultimate question of why, if God loves us enough to die for us, does He not show up in real life to participate, in person, in that eternal, individual relationship He allegedly endured the Cross in order to make possible? While dying on the cross Jesus said to His mother: “Woman behold your Son, then turning to His Apostle John He said:son behold your Mother. Mary is our mother and the mother of Our Lord. Don’t you dare trivialize her. Might I suggest that the people who trivialize Mary are those who do not care enough about her to distinguish between a genuine apparition and an obvious hoax? 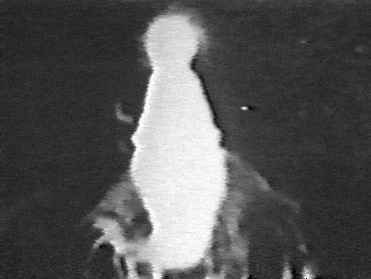 Having read books on this apparition, seen and read interviews of those who were impacted by it, for me it is a certainty it was genuine. It is the only event I know of, where a spiritual being has been photographed. There may be others that I am not aware of. I think some people experience fear when there is an apparition/monumental event that doesn’t support their rigid belief systems, they become uncomfortable and then seek to rationalise their own view. An example of this is how some serious fundamentalists will criticise the near death experience of Howard Storm, because in his conversation with Jesus and the angels it was revealed that it is what is in a persons heart that gives salvation and not the body of theology they subscribe to. Anyone who has dealt with Storm, seen him interviewed and witnessed his transformation from atheist professor who often wasn’t nice to people, to a humble pastor who cries when he talks about Jesus will know the man is the real deal. But people can become uncomfortable and even possibly imply it was the devil who saved Storm from hell and made him cry and repent over the person he was, because they are unwilling to open their minds. I do think God gives the doubting Thomas’ of this world proof of the supersensible if they look hard enough. After all the Lord allowed Thomas to touch his wounds. But it should be kept in mind not all that is supersensible is necessarily good so it can be a dangerous path to tread. Jesus gave us advice to distinguish between the good and bad: “Beware of false prophets, who come to you in sheep’s clothing but inwardly are ravenous wolves. 16 You will know them by their fruits. Are grapes gathered from thorns, or figs from thistles? 17 So, every sound tree bears good fruit, but the bad tree bears evil fruit. 18 A sound tree cannot bear evil fruit, nor can a bad tree bear good fruit. 19 Every tree that does not bear good fruit is cut down and thrown into the fire. 20 Thus you will know them by their fruits. You are certainly entitled to your opinion, but I would nevertheless encourage you to think about whether it is really consistent with itself and with real-world truth. One thing you and I both know is that there are far far more instances of God not showing up in real life than there are of His alleged appearances. If this were a genuine divine apparition, it would only prove that there is no reason (like human free will, for instance) why He can’t take a more visible and active role in dealing with His children. If there’s no good reason why God can’t show up, however, then it becomes very difficult to explain why He doesn’t. Which is more difficult, to show up and say hello, or to take on a human form, suffer on a cross, and die? Any person who loved us enough to do the latter ought to have more than enough love (and power) to accomplish the former. Yet what you and I both observe in real life is that no such God shows up. That is why you have to base your beliefs only on the second-hand beliefs of others (who may themselves have been fooled). Your article is typical Evangelical diatribe. First all even Rome admits that all revelation necessary for salvation is complete in Christ Jesus. These phenomina are nothing more than consolations at best or as you say, hoaxes. Zeitoun has been investigated by the best means possible at the time and was not found wanting. What is a consolation? The infused virtue of Hope is a free gift from God. Scripture is full of examples of Our Lord intervening with signs and wonders to strengthen the faith and hope of the disciples. Thomas and peter are prime examples. Some of the occasional Marian events appear to be along these lings tho certainly not of the same level as Our Lord’s. A consolation thus may strengthen Faith and Hope, though not to replace the fundaments of the Holy Scriptures and the life of Christ in the Church. Thus they are not meant as focal points for salvific grace, but as simple emblems of God’s wonders; not easily explained and there simply as free gifts to strengthen our paths towards sanctification. No dout some of them are the products of falsehood and deranged minds; but they are easily debunked, for their messages conflict with either the spirit or the literal meaning of the Holy Scriptures and the Church Fathers. I must disagree with your assessment that Zeitoun “was not found wanting” when examined by the best means possible at the time, considering that we still have access to those means (including some of the photographs displayed above), and they include a number of very clear evidences of a clumsy fraud. To say that the Church is satisfied with the “proof” provided is to accuse the Church of being a very poor judge of the evidence, and to suggest at least the possibility that similar “manifestations,” all the way back to the Resurrection itself, may owe more to gullibility than to divinity. If you look at the shadows on the ridges of the arches, the church appears to be illuminated from a light source above it. Could have been a tissue paper figure lowered by a suspended cable pulley mechanism and then illuminated. Or maybe it was God, or dog, who knows. Duncan – your total lack of understanding regarding the term co-redemptrix erodes any credibility you try to establish. Actually, that does not sound too plausible to me. Whether Mary were or were not an actual co-redemptrix, and whether I did or did not understand everything that “co-redemptrix” implies, the evidence against there being a genuine apparation at Zeitoun, including the obviously faked photographs, is sufficient to demonstrate to the unbiased observer that human duplicity and gullibility provide an explanation that is much more consistent with the facts than any superstitious attribution would be. In 1986 I was 9 years old and it was said that St.Marry is appearing in a St. Dimiana Church in Shoubra poor district in Cairo,Egypt. I went then and suddenly,during the prayers many people screamed out in joy that they saw her..I did not..and I asked one man was standing by me “where is she?” he pointed up to a point in the church ceiling but I did not see anything. In 2009 Mary said to appear in Warrak poor district , the same happens with me ..It was outside the church when the crowed IN the church shout that they saw the Virgin …Many people was out there did not succeed in going in to see what happened because it was so crowded then suddenly a woman beside me shouted in joy and so nervousness and said “Here she is ” nobody saw Mary but her. So how could it be happened that some people see some not if it was a Camera or Laser or whatever ?? The post here starts on the premise of requiring “genuine evidence of God genuinely showing up in real life.” This is the same argument used by Atheists against God. God and Faith are intertwined. The entire whole of Christianity and God requires Faith. Why would a Marian apparition be any different? If it is “evidence” you require, look to science – the end result is “evidence” without meaning. Don’t mix the two … they are not the same and not equal. Both God and Satan understand the Bible and Science. Which one requires Faith? Back when this occured the only people in the world theoretically speaking that would have the technology to create a ‘hoax’ image would be the U.S. Government and if you really want to stretch it, the Israeli’s. With the USA’s help. But why?? The only way I know of back then to project a ‘holographic’ image would be a laser. And at night you would easily see the laser beam doing the projection. And the appearences only occured at night. Ever go to a laser light show? You would see the light trails preceding the images. This phenomena went on for approximately 2 years. Where was this ‘hoax equipment’ hidden? And who spent 2 years operating this equipment on a weekly basis. It would take a substantial power source to operate this type of equipment back then. How does one hide that? We know the egyptian authorities cut the power in a 15 mile radius to see if it was some type of powered equipment producing this phenomena. The apparitions kept occuring. How did that happen? Then there is the geologic tectonic seismic motion (earthquake) theory. It’s good at explaining “one time” light phenomena. But no tectonic light phenomena ever stayed in one location for 2 years. How did that happen? I am not a religious person, but I laugh when skeptics whether atheists or fundementalist christians scoff at this amazing apparition. Feel free to scientifically explain the questions I have posed in this post. There’s really not much to explain. The evidence from this “apparition” is of three types: eyewitness testimony, obviously-faked photographs incorporating common themes from religious paintings, and possibly genuine photographs of dim, vague, amorphous blobs. Professional mediums produce “eyewitness” accounts of supernatural apparations all the time, even when the mediums admit hoaxing their clients, so that’s not too difficult to account for—people see what they want to see, especially when it’s dark and hard to see anything at all. Fake photographs have been with us ever since the Cottingley Fairies, so that’s not hard to account for. As for dim, amorphous blobs of light, you can do that with ordinary incense and a flashlight. Not too hard to produce in the 60’s, and a number of the witnesses even report smelling the incense. So really, what’s left to explain? Hi Eric, thanks for stopping by. The reason we look for evidence is to distinguish between things people say that exist only in their own minds from things people say that reflect an actual, objective reality independent of their beliefs and perceptions. That’s an important distinction to make—you can have all the faith you like in the power of God, but if He’s only a character in your imagination, then He’s not going to be able to pass you the mashed potatoes at dinner. When faith is the ability to fill your understanding with things that don’t really exist, it’s not really any more virtuous than indulging in hallucinogenic drugs for the same purpose.